If you are reading this, chances are you have a pump motor that needs pump motor repair. Whether you have a pool pump, heating pump for a building or sump pump for a basement, it sadly will not last forever. If and when your pump is no longer working properly, you will come to face a major question: "Is it worth it to get a whole new pump or should I just a get the motor repaired?" The cost between a motor and a pump replacement can be sizable. Over years a pump can be subject to heat, rain and even lightening strikes. The pump's internal parts can go bad and require replacement. How to know when your motor is in need of repair? Loud Screeching and Grinding noises can be a crucial sign. Besides the age of the motor, it can rust or freeze from water inside the casing. Next a humming sound coming from the capacitor. This barrel stores an electrical charge to be dispersed to either kick start or keep the motor running. A blown capacitor is caused by a surge in power or overheating but is an easy fix for NY Pump & Motor Repair. A simple pop and click sound can mean your motor is on its last legs. This can be a sign of a deeper electrical issue. Finally, if there is just silence coming from the motor, check the power source. If that seems fine then most times your pump motor is dead. This is sign that the inner workings of the motor have failed and therefore you will need it replaced completely. Keeping NY Pump & Motor Repair on your maintenance list can prevent you from the larger costs that come with a failed motor. Repairing it will make it less costly and continue running well. We advise you not to wait too long to get a pump motor repair in NY. You don't want more, potentially more serious, issues to develop to your business or apartment building. If you pump problem can't wait, we also provide prompt 24 hour emergency pump repair services. 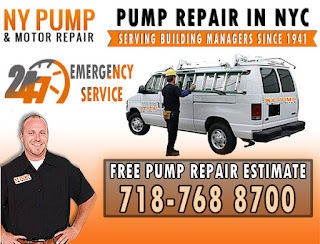 To require a pump motor repair in NY or to inquire more about our services at NY Pump & Motor Repair, contact us at (718) 768-8700.